Some sound advice from the Salamander: do NOT go totally gonzo-party overboard this 4th of July, because you’ll most definitely want to save some energy for Friday the 5th and the stellar rock ‘n roll triple bill showcased at Mickey’s Tavern in Madison. 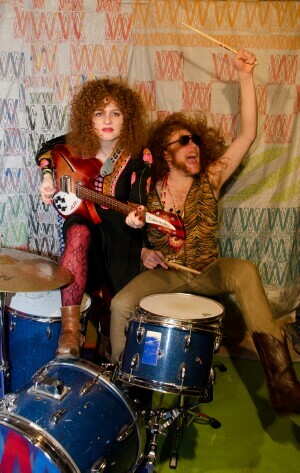 Headlining (but playing second on the bill) is the garage-rock power-duo from Chicago: White Mystery! This is White Mystery’s first Madison appearance since opening for Shonen Knife at the UW Terrace last August. Hot on the heels of the recently released ‘Telepathic’ record, White Mystery will blow their incendiary festive cookies to propel your holiday weekend into the ether! Comprised of the fiery red headed brother-sister combo of Miss Alex White (lead vocals & guitar) and Francis Scott Key White (drums & vocals), the White Mystery concert experience is a combination of reverberated Rickenbacker guitar feedback over top of primitive rhythms. Or, one might say: heavy fuzz, loud, and unabashed garage pop in a Cramps-meet-the-Nuggets-era psychedelic-band vein, with a touch of MC5, The Runaways, mod/bubblegum, and curly red hair flying all over the place! You’ll love Alex White’s tough but tuneful power-punk singing with brother Francis ending the verses in his crazed, yet sort of deadpan, punctuation. Referencing the new ‘Telepathic’ record, Alex told me, “Francis steps up his drumming, songwriting, and singing, especially on “Junglecat”.” The new track that shakes me up the most is “Dirty Hair”, which Alex describes as “an evil nursery rhyme by White Mystery”. Do you adore vinyl as much as this amphibious reporter does? ‘Telepathic’ is available on vinyl LP, CD, and cassette tape, courtesy of Burger Records, and digitally through iTunes, Amazon, eMusic, Bandcamp, and Spotify. Something for everyone, all available for mail order and in record stores! Alex’s take on the vinyl revolution is, “vinyl of course is really neat because the art is big, bold and beautiful, whereas CDs are utilitarian, and easily played in cars.” So… cruise on over to Mickey’s July 5th! This group is not to be missed. No doubt White Mystery will continue the explosive tradition of Independence Day with some wild rockin’ reckless abandon! Additionally, don’t be a trendy Eastside hipster and show up fashionably late, since first on the bill are local boys The Arge, playing their first show in two years. For this gig, guitarists Erik Burtz and Bill Borowski will be joined by Jason Jensen (Tyranny Is Tyranny, United Sons Of Toil) on drums, replacing absent drummer Zac who is currently in the balmy confines of Antarctica! With, of course, bass player and vocalist, Peter Newhall. For those unfamiliar with The Arge, they’re kind of hard to pigeonhole, but I guess I’d describe them as dirty grunge-rock mixed with 70s style twin lead guitar solos. They’re known for pulling out some classic covers along the lines of Purple and Sabbath! Rounding out the evening will be a newer trio making a buzz around town, The Non Travellin’ Band, whose debut release ‘Never Prayed Once’, is available on cassette tape released by the Oakland, CA, label Moon Glyph. This recording was captured live to celluloid by Bobby Hussy. Singer/guitarist Lue Lueck told me they should have a new vinyl record out before the end of the year. The voluminous psych-garage group also features Brother Joseph Tucci on drums, and electric guitar by Dead Luke. Word on the street is that Dead Luke may be relocating soon, so if you want to catch The Non Travellin’ Band in their original incarnation, you’d best not pass up this opportunity! Other dates to catch White Mystery in July include: July 4th at the Firecracker 500 Festival in Iowa City, July 6th at the Double Door, and July 14th at Jerry’s, both in Chicago. JUST ANNOUNCED: White Mystery will play the WORT Underground Stage at the Willy Street Fair in Madison, Sunday, September 22!